Jake Baird is being remembered by friends and family as a fun-loving kid who was “full of love and joy,” his grandfather Alfred Woollacott told The Times. “There wasn’t a person who met him who didn’t like him,” Mr. Woollacott said. 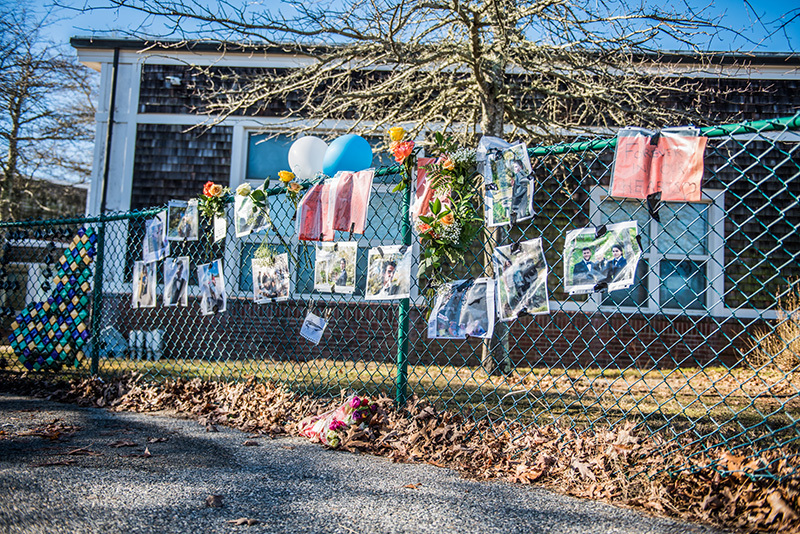 A memorial of flowers, balloons, photos, and messages emerged at Martha’s Vineyard Regional High School in tribute to Jake Baird, the 17-year-old Martha’s Vineyard High School senior. Two other teens were injured in the crash, though police, who have not released their names, said their injuries are non-life-threatening. 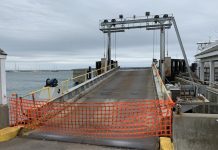 Prior to the crash, the high school senior was driving from Aquinnah to bring a friend to work, his grandfather told The Times. School was not in session Friday, but administrators opened the building for students in need of grief counseling. 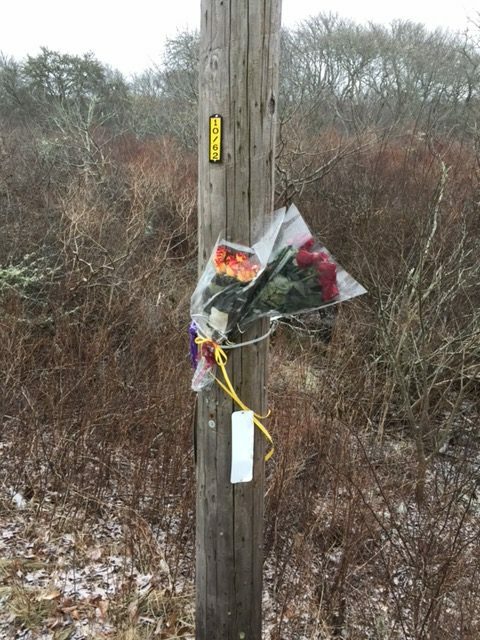 The single-car crash occurred on Middle Road in Chilmark just before 8 am. All three teens were taken to Martha’s Vineyard Hospital, according to police. 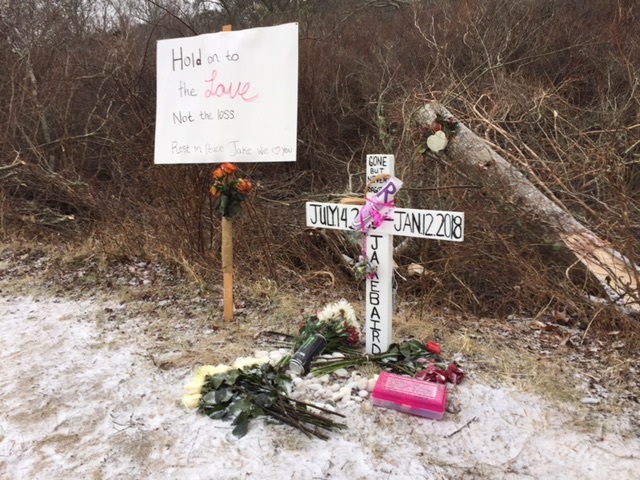 In a press release, Chilmark Police Chief Jonathan Klaren said the 17-year-old driver was pronounced deceased at the hospital. Jake Baird was killed in the crash. The crash happened near the intersection of Tea Lane, Timothy Carroll, deputy fire chief in Chilmark, said. Jake Baird’s 1994 Chevrolet Blazer appeared to have left the road, crashed through some trees, and wound up in a swamp, police and fire officials said. A passing West Tisbury firefighter first arrived at the accident, Mr. Carroll said. Both the firefighter and a Chilmark police officer, who arrived soon afterward, rendered emergency care at the scene, he said. Students and teachers gathered at the school throughout the afternoon. Counselors were also available over the weekend and Alex’s Place also provided a venue for teens to come together. “Our condolences and thoughts go out to the family and friends of Jake. 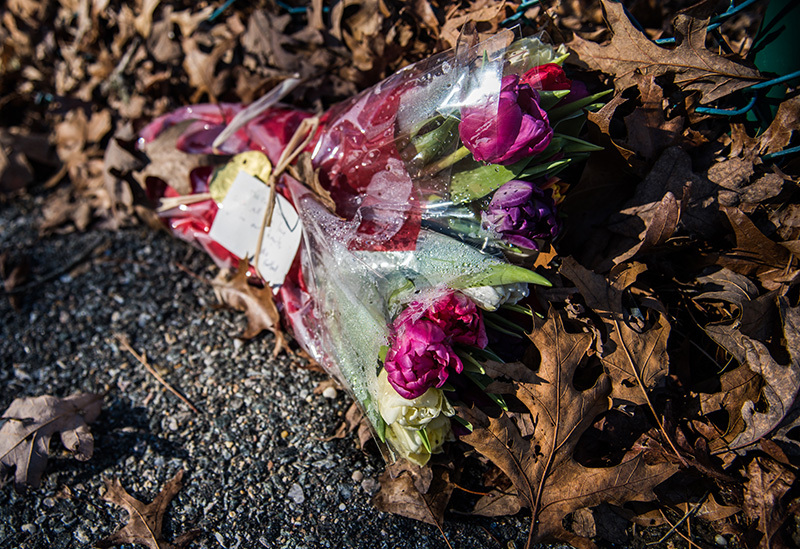 This is a difficult time for everyone, but I know our students and staff will be able to lean on each other as they remember their classmate,” Mr. D’Andrea wrote. Guidance counselors are making arrangements for students to reschedule exams if needed, Ms. Dingledy wrote. “Other students will take their midterm exams starting tomorrow and finishing on Monday,” she wrote. Police remained at the scene well after the crash, waiting for the state police accident reconstruction team to arrive. Skid marks could be seen on the road shoulder Friday morning. The Blazer was about five feet off the road in boggy brush. The back of the vehicle was ripped off by rescue crews using hydraulic tools to remove those injured in the crash. Debris from the vehicle was strewn throughout the woods, and the vehicle’s window was smashed. In an obituary submitted to The Times, Jake was described by his family as “fun-loving, honest, and moving at times to a different drumbeat.” He was “admirably unafraid of standing outside of convention,” the obituary states. Jake is survived by his parents, George Baird and Alyson Woollacott; his sisters Rya and Jayden Baird; and maternal half-siblings Aneecya, Jahlil, and Jamere Willis; grandparents and guardians Alfred III and Jill Woollacott; grandparents Janice and Sonny Silva; and many other relatives listed in his obituary. Jake was a member of the Wampanoag Tribe of Gay Head (Aquinnah), like his father, grandmother, and uncle, who is tribal medicine man. His aunt is the vice-chairwoman of the Mashpee Wampanoag. Among tribal activities he participated in was a weeklong leadership conference in Washington, D.C.
“He had a deep bond with his father,” Mr. Woollacott said. Jacob lived in Oak Bluffs with his grandparents, but often spent weekends with his father, who lives in Aquinnah. One of Jacob’s favorite haunts was Copper Wok. Mr. Woollcott said he would bring his grandson there for the sushi that he delighted in. On Tuesday, Chapman, Cole and Gleason Funeral Home in Oak Bluffs released information about services. On Thursday, Jan. 18, at the Ag Hall in West Tisbury from 2 to 5:30 pm, there will be a visitation with family, and at 5:30 pm there will be a period of sharing memories of Jake. Visit ccgfuneralhome.com for online guestbook and information. 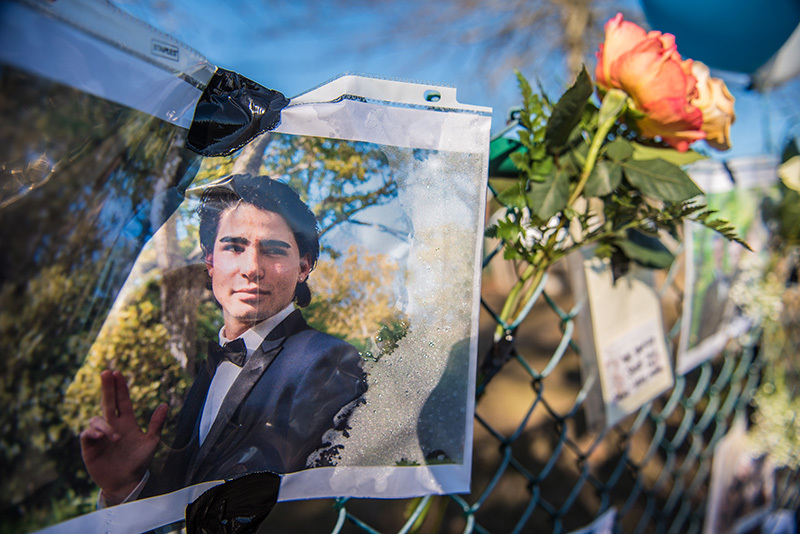 There has been an outpouring of condolences on Jake Baird’s Facebook page, as well as other social media sites, as the community attempts to come to grips with the tragedy. 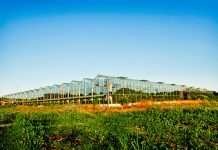 At Vineyard Gardens in West Tisbury, where the high school student worked as a landscaper and in the nursery, he was being remembered and mourned. “It breaks my heart,” she said. Mr. Woollacott said that there are “good points and bad points to living on an Island where everybody knows everybody.” In the wake of Jake’s passing, he said, the good has really shone through with the rally of support the Vineyard has shown. George Brennan contributed to this report.